Almost 65 years after his death it's still difficult to conduct a reasonable discussion that includes references to Hitler. Most of the blame lies in too much reductio ad Hitlerum, namely in taking anything Hitler did and using that to try to draw a comparison to a modern figure. Hitler gave good speeches too! Hitler was elected too! are two of the most common. On the other hand though, there is also a tendency to overly refer to Godwin's law whenever the subject comes up, suddenly changing the conversation into a meta discussion on discussion itself instead of the previous subject, even if a comparison is valid. So let's go over a bit of background that may help in finding out whether a comparison with him really is warranted or not, as well as the guilt or lack of it among those that met and worked with him. In addition to Hitler himself, comparisons are often drawn to people before and during WWII that met with Hitler, the insinuation being that they agreed with him and thus resemble Hitler to a certain extent. Here's one. Uh oh, it's a member of the Vatican with Hitler, so the Vatican must be like Hitler. Well, not from this picture alone. The reason why is that it's from 1934, well before WWII started, and even before the 1936 Berlin Olympics. In fact, President Hindenburg also only died in 1934. So pictures from early Hitler rule in Germany need to be substantiated with other proof (Nazi membership, statements on white supremacy, etc.) in order to make the case that Person X is like Hitler. Beerhall Putsch - late 1920s: Ha ha, that's that guy that had the failed Putsch. Up to 1930: That's the guy that leads the Nazi party, but they're just one party. 1930 - 1933: That's the guy that leads the Nazi party and they're the largest party in parliament, but they still don't have a majority of seats. 1933 - 1936: That's the new chancellor / that's the guy that rules Germany / uh oh, that's the guy that rules Germany and has outlawed all other parties and (depending on the person) that's the guy that restored the German economy and presided over the Olympics. One of the first events that gave a clue as to Hitler's motives being less than peaceful was the remilitarization of the Rhineland in March 1936. Before that Germany had begun to rebuild its military, but agreements like the 1935 Anglo-German Naval Agreement gave the appearance of a willingness to work with the rest of the world in doing so and keep its military strength to a modest level. And while Germany's reentry into the Rhineland was sudden and unexpected, it was also largely ignored since many thought Germany had gotten a raw deal from the Treaty of Versailles anyway and they were just taking back what had been theirs. It was only around 1938 that Hitler's bullyish nature became extremely clear, as demands were made on Austria and its chancellor Schuschnigg to instate Nazis in various parts of the government, and free those that had been imprisoned. Schuschnigg attempted to hold a plebiscite among the Austrian people on whether they wished to be independent but this was prevented by threats from Germany as well. Eventually they succeeded in making Schuschnigg resign and Austria a part of Germany. Now, keep in mind that at this point it had become obvious that Hitler was a bully. What wasn't obvious yet was that he was going to turn into a genocidal maniac. 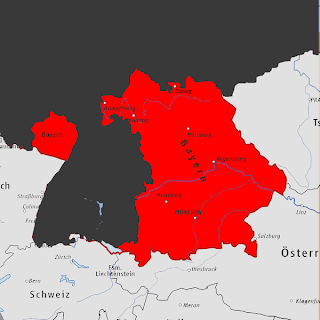 Even with the Anschluss of Austria the world wasn't interested in going to war with Germany, and though more disappointment followed after the annexation of the Sudetenland in Czechoslovakia, the world wasn't interested in going to war. Europe was almost out of patience at this point though. In fact, if Hitler had suddenly died of a stroke in October 1938 and Göring had taken his place (who was opposed to most of Hitler's decisions to wage war, though he followed them faithfully after the decree had been made) he probably would have been remembered as one of Germany's greatest leaders. On all sides Germany was assailed as a barbarous nation. 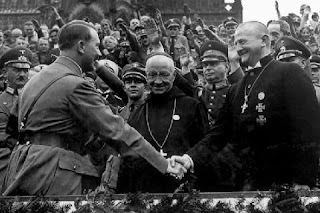 Many Germans agreed and other party officials beside Himmler joined in the condemnation of Goebbels. Göring complained directly to the Führer that such events made it impossible for him to carry out his mission. "I was making every effort, in connection with the Four-Year-Plan," he later testified, "to concentrate the entire economic field to the utmost. I had, in the course of speeches to the nation, been asking for every old toothpaste tube, every rusty nail, every bit of scrap material to be collected and utilized. It would not be tolerated that a man who was not responsible for these things should upset my difficult economic tasks by destroying so many things of economic volue on the one hand and by causing so much disturbance in economic life on the other hand." Then Hitler, according to Göring's account, "made some apologies for Goebbels, but on the whole he agreed that such events were not to take place and must not be allowed to take place." Hitler was already giving the impression that he knew nothing of Crystal Night and added his own complaints. "It is terrible," he told Gerdy Troost, widow of the architect Professor Paul Ludwig Troost, whom Hitler admired above all. "They have destroyed everything for me like elephants in a china shop...and much worse. I had the great hope that I was about to come to an understanding with France. And now that!" But Fritz Hesse, summoned to Munich from London for a special press conference, claimed he overheard otherwise from Hitler's own lips the very night Crystal Night was set into motion. At dinner the Führer was boasting how he had bluffed the English and French at Munich when an adjutant whispered something to Goebbels. He turned and muttered to Hitler. At first Hesse couldn't hear what was said ,but when the others at the table lapsed into silence it became clear that the Propaganda Minister was explaining a mass attack which he and the SA were going to launch against the Jewish shops and synagogues in a few hours. There was no doubting the Führer's approval, recalled Hesse. "Hitler squealed with delight and slapped his thigh in his enthusiasm." 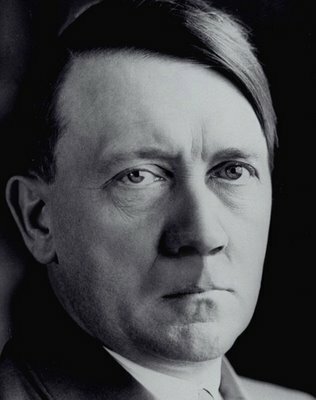 "the world will yet come to see a very great man – mystic in Hitler. [...] I cannot abide in Nazism – the regimentation – cruelty – oppression of Jews – attitude towards religion, etc., but Hitler, him – the peasant – will rank some day with Joan of Arc among the deliverers of his people." Small countries have a special place in WWII, because with their extremely limited clout and the impression until the war that the rest of Europe wasn't all that willing to risk sticking its neck out for countries like Austria and Czechoslovakia, there was little reason for other countries to publicly oppose Nazi Germany or Italy. When assessing the actions of a government of a smaller (populationwise) country, one therefore needs to take a look at actions beyond that of simply allying oneself with Germany or not. Finland for example was attacked by the Soviet Union during the Winter War, and saw Operation Barbarossa (Germany's invasion of the Soviet Union) as a good opportunity to retake the land they had lost and there was cooperation between the two countries. 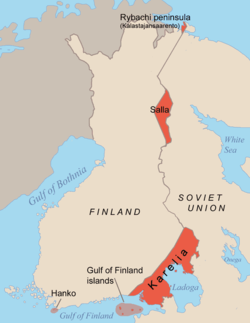 However, Finland never subscribed to Nazi ideology and this can be seen by the treatment of Jews in Finland during WWII. The way a country treated its Jewish minority as well as how democratic it was overall is a much more accurate way to assess a country's character during WWII than simply looking at official military treaties or cooperation. This is probably the best way to draw an accurate comparison to Hitler among world leaders, since this was his style of diplomacy with other countries. His most common ultimatum before invading a country was to complain that the German minority was being abused and needed his help, while in order to disguise this he would come across as ready for a peace treaty one day, then bellicose and frightening the next. Negotiations between Germany and Poland around the time of the Dahlerus Mission are a good example of this, with Hitler promising a peace treaty one day and then threatening to smash Poland into the dust the next. Too much of this, however, and even Chamberlain stopped trying to believe that peace could be achieved. On the night of August 30 Dahlerus presented Chamberlain with a message from Hitler about a magnanimous offer (grosszügiges Angebot) for Poland that would solve everything, but "Chamberlain himself was now so determined to resist Hitler that he never even asked the Poles if they would submit to the time limit and by the time Dahlerus was back at 10 Downing Street negotiation seemed impossible." One more account from Dahlerus shows another characteristic that marked Hitler, his psychological instability. Dahlerus pointed out that England and France also had greatly improved their armed forces and were in good position to blockade Germany. Without answering, Hitler paced up and then suddenly stopped in his tracks, stared and began talking again (Dahlerus recalled), this time as if in a trance. "If there should be a war, then I will build U-boats, build U-boats, build U-boats, build U-boats, U-boats, U-boats." It was like a stuck record. His voice became more and more indistinct. Abruptly he was orating as if to a huge audience, but still repeating himself. "I will build airplanes, build airplanes, airplanes and I will destroy my enemies!" In consternation, Dahlerus turned to see how Göring was reacting. But the Reichsmarschall appeared not at all perturbed. Dahlerus was horrified: so this was the man whose actions could influence the entire world! This is tough to find in current world leaders though, because most are very good at covering up private details such as this, which often only surface years later in biographies. It's important to remember that it's possible to resemble Hitler, but not to have the authority or opportunity to carry out the same acts. Hitler might have been born in a tiny country like Albania instead of Austria next to Germany, or he could have been accepted to art school and become a professional artist, he could have been assassinated during one of the early attempts on his life. Without the economic and political instability after World War I there would have been much less fear among the populace. The short-lived Bavarian Soviet Socialist Republic shows that fear of communism among many was based on a very real threat. His mother could have lived to a ripe old age too. The negative characteristics that probably most resembles Hitler though are: 1) a continuous reference to battling an enemy that must be destroyed at all costs, and 2) a tendency to become too excited, fly off the handle and make rash decisions at a moment's notice. Put these together in the hand of someone who controls a country and you have a recipe for disaster. Well, this has been a pretty long post. Let's finish it up with a good rule of thumb. If someone is comparing World Leader X to Hitler, simply steer the topic toward more clarification. Which Hitler? When he was running in elections in the early 1930s? When he invaded Poland? When he wrote Mein Kampf in jail? When he invaded Russia? When he stopped eating meat? Doing that will let one know whether the comparison is valid, and if the person making the comparison even knows the first thing about Hitler in the first place in order to make it. His story is simply too complex for "man, that guy's just like Hitler" to really mean anything, and turning the topic away from internet memes and back toward specifics of history can only improve the discussion.